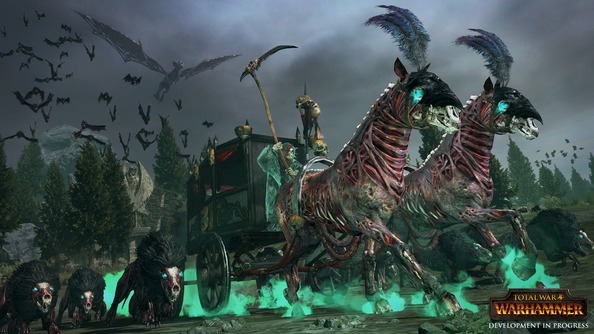 Delays or no, Total War: Warhammer’s still got plenty to show. While the rest of us will be waiting until May 24th to go Greenskin/Human/Skeleton smashing – let’s be honest, everyone’s playing Chaos first time through – we can at least watch the progress of the various factions in Creative Assembly’s videos. This go round it’s time for the Vampire Counts to have their moment in the … well, not sun, but some sort of light that doesn’t burn their flesh. Spend two months plotting victory in the best strategy games there are. There’s no battlescape gameplay here, just plenty on the campaign map of a mid- to late-game empire. I’m a little wary of the politics in a Warhammer game. Give me a tiny man firing a flame cannon at a giant bat in a massive underground passage, sure, but is it realistic for them to be allied? It feels stupid even to type it out, but it does seem like there should be some limits on who can be mates with who. Maybe my Warhammer-fu is off, and Dwarfs are actually okay with zombie-loving vampires. Speaking of, that Raise Dead stuff is super cool. It’s a shame you have to research the units you’ll get from it first, rather than creating these epic conflicts between two rivals being a sneaky way to give yourself an early power-boost. Still, it’s a rad way to move forward, and very much in-theme. Quite excited to see what Archaeon’s army has in store too – 40k was always my bag, but I’ve a big soft spot for Chaos in all forms. Speaking of, those northern badasses are yet to have their big reveal. They’re the pre-order faction so presumably they’re last to be finished, but I’d expect their own set of videos, as well as a Vampire Counts battle, soon enough. Two months remain – where are you sitting on Total War’s foray into fantasy? For more on the undead, have a look at our Vampire Counts preview. For the rest, here’s everything we know about the game.